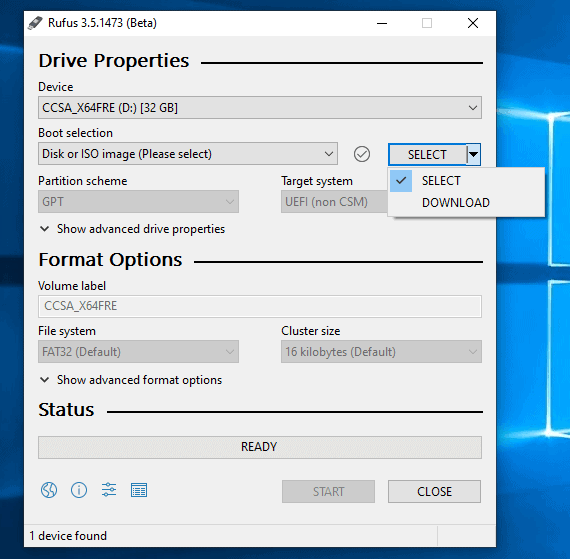 The next version of Rufus, a small portable tool to create bootable USB Flash drives, includes an option to download the Windows versions Windows 10 or Windows 8.1. Rufus is a popular lightweight tool to create bootable Flash drives, e.g. to install Windows or Linux on another computer system. The process is very simple and straightforward: start Rufus, select an ISO disk image that you want to use to create the bootable Flash drive, connect the Flash drive, and hit the start button to begin the process. Rufus offers a selection of configuration options, e.g. to select the partition scheme GPT or MBR, or file system on the Flash drive. Check out our review of Rufus 3.0, an updated review of the 2018 release. Rufus 3.5, available as a Beta right now, adds a download option to the program. You had to download the ISO image manually previously before you could make use of Rufus; this process changes with the release of Rufus 3.5, at least for Windows installations. The Select button in the program interface features a small down arrow icon that you may activate to switch between “select” and “download” when “Disk or Iso image (Please select)” is selected under “Boot selection”. Rufus downloads a PowerShell script when you select the download option (you have to click on the download button after selecting it to start the process) and starts it. The script displays the available ISO images that you may download. Rufus supports official versions from Microsoft only, and displays the available operating system versions after you select Windows 8.1 or Windows 10. Selections are quite good: you may download Windows 10 version 1809, 1803, 1707, and even earlier versions of Windows using the new download options. You are then asked to select the edition that you want to download. For Windows 10, Windows 10 Home/Pro, or Windows 10 Education were offered. For Windows 8.1, regular and Professional were offered (plus special versions such as Windows 8.1 N). You need to select the interface language in the last step. Tip: The Fido script is available as a standalone PowerShell script as well. If you just want to grab that, you can do so here on GitHub. The script downloads the selected ISO image from Microsoft. Make sure that you have enough free disk space to store it on the device. Once downloaded, you may create a bootable USB drive using the downloaded ISO image. The selection menu was displayed only on one device that I ran Rufus on while it was not displayed on another. Rufus 3.5 is available as a beta currently and bugs like this are to be expected. If you run into the same issue you may download the PowerShell script manually and run it to get a Windows ISO image that way. The integration of download options for Windows ISO images is a welcome addition to Rufus. It should make the program more useful even though it is not too hard to visit the official Windows 8.1 or Windows 10 download pages on the Microsoft website to download the images manually. All in all a welcome change. The developers should consider adding options to download certain Linux distribution ISOs as well in upcoming releases.